Dental tourism (also called dental vacations) is a subset of the sector known as medical tourism. It involves individuals seeking dental care outside of their local healthcare systems and may be accompanied by a vacation. It is remarkable that along with the countries of awe-inspiring natural beauty such as Switzerland, New Zealand, Mauritius and other splendid nations, the Indian subcontinent is also frequented by visitors across the globe. However, the preference of visitors for India is largely on account of the pristine beauty of the Himalayan region and the splendid locations of Himachal and Kashmir though notably, India is currently considered as the hot spot for tourists around the world for the top-rated and cost-effective dental and overall medical facilities available in the country. Amongst all medical treatments, dental implant and other dental treatment therapies are highly sought after by patients throughout the world and as dental treatment in India is cheaper than the dental solutions offered at hospitals in the US, UK and other first rated countries to a significant extent, dental tourism has emerged as a major source of revenue collection in India. Visiting a foreign location to avail low-cost dental treatment facilities is termed dental tourism, more specifically dental tourism is a part of the medical tourism sector and it signifies vacationing while availing the advantages of comprehensive dental care. Pertaining to dental tourism, it is notable that this phenomenon is facilitated by the cost difference of the dental healthcare system of different countries. People from the US, UK or other nations where medical treatment is expensive can obtain dental solutions, namely, dental implants, bleaching, gum treatment, porcelain veneers, fixed teeth replacement and various other dental therapies at a fraction of the price charged in their own countries by visiting dental clinics located in Indian cities such as Delhi, Mumbai, Hyderabad, Chennai, Kerela and Goa. These Indian states offer state-of -art dental clinics providing almost all types of dental solutions such as child dentistry, gum treatment and surgeries, mobile teeth solution, crowns and bridges, fitting braces, tooth extraction and many other dental treatments. Alongside providing state-of-the-art dental surgery and top-rated dental therapies, Kerala, Goa and other key areas where dental tourism is flourishing rapidly, also offer the opportunity to enjoy mind-blowing natural and tranquil landscapes as well as mouth watering delicacies. It is especially important to note that India has gained worldwide recognition as the topmost dental tourism destination on account of its top-notch infrastructure and high technology that is capable of rivaling the dental healthcare available anywhere else in the world. India is equipped with the best hospitals as well as treatment centers providing the best facilities in the world and further as the dental healthcare system in the country has gained tremendous government support and approval, the dental tourism industry in the country is growing by leaps and bounds. Therefore, it is practically advantageous to consider visiting the popular dental clinics in India if you are aiming to undergo dental implant or other dental treatments. Moreover, if you are not a beneficiary of dental insurance, the costly dental treatments available in your home country can be quite burdensome. To enjoy a fun filled vacation along with getting the right dental treatment visit India and avail the double benefit. The worldwide popularity of Indian dental tourism is made apparent by startling statistics that reveal that around 28 per cent patients from the European countries and 21 per cent patients from North America have contributed to the growth of dental tourism in India. Finally, considering the alarming proportion to which dental problems are capable of putting your health at risk and by taking the fact into account that there is a serious relationship between advanced gum disease and stroke, heart disease and bacterial pneumonia, it becomes highly essential for you to obtain dental treatment if you are suffering from a dental ailment. And for top-rated dental solutions at inexpensive rates, none but the Indian subcontinent is the ideal destination. Cost-effective and tailor-made dental packages. Arrangement for quality dental treatment in top-rated dental clinics and hospitals offering special and personalized treatment for foreign patients. Immediate check-up after arrival at hospitals/clinics without subjecting you to long waiting hours. Flights, visa arrangement and accommodation facility provided to all international patients. Effective coordination with doctors and hospitals would be carried out on your behalf. A special channel of communication to be established to keep informing relatives at your home country about your treatment. Special arrangement for holidaying after recuperation. For countries within the European Union, dental qualifications are required to reach a minimum approved by each country’s government. Thus a dentist qualified in one country can apply to any other EU country to practice in that country, allowing for greater mobility of labour for dentists (Directives typically apply not only to the EU but to the wider designation of the European Economic Area – EEA). The Association for Dental Education in Europe (ADEE) has standardization efforts to harmonize European standards. Proposals from the ADEE's Quality Assurance and Benchmarking taskforce cover the introduction of accreditation procedures for EU dentistry universities as well as programs to facilitate dental students completing part of their education in foreign dentistry schools. Standardization of qualification in a region reciprocally removes one of the perceptual barriers for the development of patient mobility within that region. Cosmetic Dentistry has recently became a very popular way to improve your looks and there has been a huge increase in the popularity of dental tourism over the last few years. You will find that people living in countries where the cost of cosmetic dentistry is exceptionally high, will look abroad, knowing that there are options which can save them money. Friend and relatives will often ask them to reconsider, arguing that the safety of having a cosmetic procedure carried out in a "less advanced" country is asking for trouble. But how true is this allegation? The truth is that although there are some recorded instances of people traveling abroad for dental treatment, that had ended up with results they are not satisfied with, it does not seem to be any more common than finding people being unhappy with the results of a full-price dental treatment in their home country. The facts are that it is not safer to have dental surgery in a "full price" country such as the United States or the Republic of Ireland, compared to "cut-price" countries such as Mexico or Slovakia. 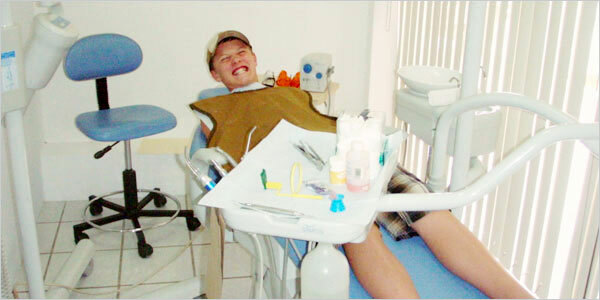 It is imperative that when considering overseas dental treatment, you do thorough research. "Where should I get it done?" is one question you should research. "By whom" is another. Because you will find in places like Mexico, India or Hungary, there are better and worse dentists – just like in any country. Traveling for your dental treatment is something that more and more people are doing, without any negative outcome. You can do a search on the internet and you will find many sites that offer you teeth whitening treatments in different countries at a wide range of prices. This creates a situation where the possibility are that you will spend less money – on the treatment and travel combined – than what you would have, by staying in your home country for your teeth whitening treatment. There are many countries – usually those where the per capita incomes are higher – where dental treatment is really more expensive than it needs to be. The Treatment Centers, knowing that people are often prepared to pay the going rate, set their prices as high as they could. People in those countries who are prepared to do a little bit of shopping around will find that they could get a better deal abroad. You will of course find a number of people who stick to the maxim "you get what you pay for" and they believe that by going abroad for cheaper dental treatment they will get poor-quality treatment, and by cutting costs they would have cut their standards too. This is actually not the case, in the huge majority of such situations, you will find that the quality of the procedures does not vary greatly between different countries and locations – and in many cases clients that go abroad are happier with the treatment they received than those who remained closer to home. Another advantage when you decide to have your teeth whitening treatment done abroad is that you can combine it with a long-delayed vacation and come back home with a happy and confident smile. These involves an individual traveling to other country to try and receive dental treatment which is expensive in their country. Individuals will travel abroad for treatment and later on come back home once their treatment is done. Dental treatment may be cheaper in other countries that it is in your country, and for individuals who need a lot of treatment or ones that need a lot of work, can find it easier to travel than to spend a lot of cash on treatment that would be otherwise cheaper in other areas. Individuals who have an employer who provides dental insurance, may find it easier to get treatment for their teeth as they already have it covered. For individuals who do not have this option, traveling to an area that offers cheap dental treatment is the best idea to go for. Individuals get quality service whenever they travel abroad for dental treatment. It is easier to get quality services elsewhere because in the country the payments they may be receiving from you are expensive and they will provide the best service as they believe you have paid a good price for it. Individuals can use the traveling opportunity to visit the areas they go for the dental treatment. Traveling can be a very expensive activity and so if an individual uses this opportunity will going for treatment they can save up on a lot of costs. Dental tourism is usually cheaper abroad and so this means that individuals will travel to distant areas where cultures are different and they can enjoy different scenery and landmarks. It is cheaper to get this kind of treatment in travel countries you choose because the administrative and labor costs may be cheaper. Labor costs will cover the staff and their payments which in this countries will be slightly cheaper, as compared to other countries where dentistry may require a lot of payment. Getting cheaper payments for your dental treatments requires a lot of research and so individuals need to be very careful before they decide where exactly to go for the best treatment. Individuals need to make sure that the treatments are legal and safe before they decide to go for dental tourism. However, one should always take time compare insurance rates from a number of insurance companies. Assessing insurance packages is the only way one can get cheap dental insurance covers. At last, you need to have a few good contacts to make the dental tour and the whole package look better and inexpensive. Dental tourism, basically a part of the medical tourism industry, has seen considerable growth in recent years. Though the medical tourism industry has seen growth, dentistry has been the most acceptable and the most traveled for treatment in this industry. This article will highlight a few reasons why dental tourism has seen such wide acceptance. Many patients from US, UK and Canada travel for dental treatment. In the US, almost 1/3 of the population does not have dental insurance. In UK and Canada, what prompts many patients to travel for their dental treatment is the long wait time. Patients sometime have to wait for a couple of weeks if not months for their dental appointment. Cost saving is the most important factor for medical travel. Patients can experience cost saving of up to 50% to 90% depending on the country they travel to. South American countries such as Mexico, Panama and Costa Rica have become hot spots for dental medical tourists due to close proximity to the US and Canada and lower costs. People from European countries that have high cost of dental treatment, such as UK, Germany, prefer traveling to East European countries such as Hungary, Poland, and Turkey etc. The technology and techniques used in many medical tourism destinations also matched the best in the world. To attract medical tourists, dentists have started adopting the latest in technology such as dental implants and lasers and promoting their clinics. This coupled with lower costs has made dental tourism very attractive. For those who are a bit more price sensitive and are willing to travel, Asian countries such as India, Thailand, and Malaysia are also good options. Dental treatment in these countries cost much less than their counterparts in South America and East Europe, but medical tourists traveling to Asia have to deal with culture shocks, long flights, communication barriers as well. Though in addition to the cost benefit, the technology and techniques used by dentists in Asia are at par with the developed nations. In addition, there are various other factors that have helped medical tourism in the field of dentistry grow so rapidly. As dental treatment is relatively a lower risk procedure, people are more willing to travel to neighboring countries for their treatment. Dental treatments don't require long recuperation time. Patients can leave as soon as the treatment is completed. Medical tourists can also take advantage of the time between appointments to tour the country. Dental treatment doesn't require you to be admitted to a hospital, thus giving patients the independence to move around. Positive PR and good success rate has also added to the confidence to patients who are delaying their dental treatment and are unsure of traveling for their medical needs. Medical tourism facilitators have also helped greatly in growing this industry as a whole. Traveling to a new destination for a medical procedure can be a bit overwhelming, but medical tourism companies, who do all the necessary work for you, have made the whole process seamless. They help remove all the If's, And's or But's from the equation and provide a helping hand from the time you decide to travel till the time you safely complete your treatment and reach back home. The positive aspect of dental medical tourism is that, at least now people have an option of getting the treatment they need. Dental Tourism in India is emerging as a preferred destination for dental tourism because of low cost while comparing other countries. In abroad the dental implant and other such treatments are costlier. A huge number of people fly from United States of America, Europe and other parts of the world to India for dental treatment, this is because of efficient treatment in low cost. In US up to 50% of population has insurance cover for dental treatment and the cost of dental treatment in US is extremely lofty while compared to Asian countries. Dentistry in India is famous for its successful dental surgery and treatments like implantology and dental implants. Almost every Dental Tourism providers within India offer a cosmetic dentistry package to improve one’s appearance and smile. Tooth whitening, dental bonding, dental veneers, tooth reshaping, gum reshaping, inlays, onlays and other such cosmetic dentistry treatments are available in India for comparatively low rate. Today it is possible to use internet facility for comparing payment options and accommodation facilities of different countries. Some of the benefits of Dental Tourism are; low cost, high quality, immediate service, great convenience, travels opportunities. Some of the countries which provide the patient a low cost and effective dental care are Mexico, Costa Rica, Turkey, Hungary, India, Thailand and Singapore. t was going to cost Greg Crawford "half of my arm and half of my leg as well" to lose all of his teeth. After 40 years of watching his teeth literally fall apart despite spending thousands of dollars on dental treatment, a dentist gave him a quote of nearly $30,000 to pull the lot out. "My teeth were just absolutely shot. From a small kid, I just had problem after problem after problem. I would go to dentists, get fillings, and three months later they would fall out. [I am] just a freak, I think," Crawford says. "I got to the stage where I had no self-confidence at all. My teeth were that bad, some of them were right down to the gum, just because they were breaking off. I didn't want to spend any more money on them." So the Gold Coast painter turned to the internet to search for an alternative. He landed on the website of Dental Express, a company set up by a man based in Orange by the name of David Stuart, and was on a plane to the Philippines for his dental treatment – at a third of the price – only a month later. "Dental tourism" is the catchy name for a growing industry attracting Australians to countries such as the Philippines, Thailand, India, Hungary or Poland for major dental work. It has followed the boom in "medical tourism", where people travel overseas for cheaper cosmetic and other surgery. The trips often combine daily appointments in the dentist's chair with sightseeing, shopping, massages or day spa treatments, and result in a new set of choppers at a significantly reduced cost. Advocates say the quality of the dental work is comparable with that received in Australia; detractors say that if it sounds too good to be true, it is. But with dental bills causing as much pain as the dentist's drill, many are prepared to take the chance. The fees charged by dentists rose by 9per cent between 2006 and 2007, and by 49 per cent since 2002, according to the Australian Health Insurance Association, the peak body for private health funds. The benefits paid by the funds were failing to keep pace, rising by 33 per cent over the five years, leaving patients to pay the widening gap. And the new Federal Government looks no more likely than previous governments to bring dental work under Medicare. There is no record of exactly how many Australians go overseas for dental work, but the best estimate is several hundred each year, and rising steadily. In the United States, it is estimated that about 200,000 people sought dental treatment overseas in 2006 – a figure that had grown at least three-fold in only two years. Increasingly, more people are choosing to save on their dental treatment by travelling to emerging countries where the cost of treatment is far less. This is partially fuelled by squeezed household budgets, a shortage of dentists in countries like the U.K. and the dramatic savings that can be made by going abroad. For example, according to RevalHealth.com nearly 60,000 people search for information regarding foreign dental treatment in the U.K. a month. With savings reported by some companies to be often well over 100% it is no wonder that the search volumes are so high and appear to be increasing rapidly. So which countries are people choosing to visit on their “dental holidays”? According to statistics the most popular countries to have treatment done in are Hungary and Poland. After these Turkey, Spain, Thailand and Bulgaria closely follow. Many dental tourists see the opportunity of having treatment abroad not only as a huge cost saver but as a holiday as well. Smile Savers Hungary – a dentist abroad based in Hungary, markets their service to play on this fact, offering packages that include flights, airport pickups and treatments. If you are considering hopping on a plane for a dental holiday what should you look for when choosing a dentist abroad? First and foremost should be the quality of the dentists that will be carrying out the work. Checking that they hold approved medical qualifications should be the first item on the checklist. Every dentist should feel comfortable showing you their qualifications and if not then alarm bells should be ringing. Secondly, the clinic should be fully equipped and up to modern standards. Again, this is something that should be researched thoroughly before you set off abroad. Other things to look for are awards; does the company have any accolades or awards for quality or service? These can be good indicators of the level of quality and safety. Most clinics should also be able to provide a portfolio of work, client testimonials and references as well should they be asked. Finally, you can check if the clinic is on any registered lists held by their respective governments. Top company are likely to have registered UK company numbers if they are trading in the UK at all. Hopefully with this information in hand you will be much better placed to search for a dentist abroad whichever country you decide to visit for your treatment. Vacationing in another country gives tourists the chance to sightsee, relax and learn about another culture. To some, it also provides an opportunity to get a root canal. When Americans find themselves unable to afford extensive dental work in the U.S., many put off visits with their dentist. And some become dental tourists. “Given the economy that we have now, lower cost alternatives that are available outside of U.S. borders are certainly appealing to many individuals,” said Dr. Edmond Hewlett, a consumer adviser for the American Dental Association (ADA). Hewlett, who is also a professor at the UCLA School of Dentistry, discussed dental tourism and the implications surrounding the practice. Why dental care in the United States is so expensive compared to other countries? Well, the cost of dental care in the U.S. reflects a very robust system of safeguards that we have here. First of all, there’s the level of training and education that dentists need to obtain before they can even practice. Then there are safe guards in place that most people aren’t even aware of, but they’re there and protecting them all the time. Things like very strong infection control guidelines that dentists need to make and maintain the standards in their office [and] radiation safety guidelines. Then there’s the Food and Drug Administration that regulates all the materials and instruments, procedures that we use in dental practice. Then there is the need – God forbid if something does go wrong – [for] dentists [to] carry malpractice insurance…. It’s an infrastructure that requires money to support and maintain. But it’s all there to protect our patients. Do you think the growing practice of dental tourism will stimulate changes from American dentistry in reaction? We have a wonderful system of dental care here as far as the quality and the high standards that we meet. I think it’s fair to say that it’s second to none in the world. We certainly wouldn’t want to and there’s no indication whatsoever that any of that is going to change. In my personal opinion, I think it speaks to the broader issue of health care in general and the affordability of health care and the availability of some means to the working poor and uninsured to help make health care (at least basic health care) available to them…. I think [dental tourism] is symptomatic of a much bigger systemic problem that we have here. What are the benefits of having a local dentist? One thing about going overseas for specific work versus having a dentist here is the idea of a long-term, ongoing relationship. When you have a dentist here that you go to regularly, the dentist is going to become personally acquainted with you and your own needs and own history. That’s very valuable. That person is going to be in a very excellent position to advise you as far was what your care needs are. Many dental tour operators have a wide range of packages from which travelers can choose what kind of dental treatment they would like along with excursions to some of India’s famous tourist sights. dental Tourism is a concept or practice of travelling across international borders to obtain health care- be it a dental, dental or a cosmetic treatment. In the 21st century this fast growing phenomenon of dental vacations is fast changing the conventional concept of health care. With the health care costs skyrocketing in the developed countries, dental treatment has become a costly affair. Patients in these developed nations are increasingly looking for treatment options in countries like India, which offer similar or even better dental services at rates that are much more affordable. Another reason that has led to the growth of dental tours is the long delay and waiting period for certain dental treatments in some countries. While in US you might have a waiting period of several months for certain surgical operations, in India it is done in a few weeks. People prefer to travel to India for such treatments, than wait for years in their home country and bear the inconvenience. Moreover the ease and affordability of international travel, rapidly improving technology and high standards of dental care has all contributed their share in increasing the popularity of dental tourism in India. This process of Healthcare tourism in India is being facilitated by the corporate sector in the medicine industry along with the tourism industry in the public and private sector. There are several dental tourism packages in India that promise you a world-class treatment along with an exotic holiday experience. They help you get the perfect mix of health, wellness, relaxation and fun. There are several health care packages available through dental tourism companies of India, who can arrange for attractive tour packages from anywhere in the world to India. A dental travel agency in India can handle your problem, fix up the required treatment in India and then fit in a sightseeing tour for you. Sometimes these dental tourist companies make arrangements for recuperation holidays for patients, so that the holiday can help them to revive their energy after a surgery for example. You can choose the health care package that fits your budget. The dental tourism packages are especially attractive because of the price that you pay in comparison to the prices in Europe and America. A complete healthcare package in India would include all help related to your dental and travel needs. The dental tourism operators in India have specialized in this branch and can provide you with whatever information you need. They help you to organize the dental treatment, the travel, hotels and then add a holiday with it. Dental treatment in India is also offered as a part of dental tourism in India where you can get total dental solution and care along with a planned holiday of your choice. Dental care treatment is generally not reimbursed by the National Health Schemes in many countries and hence often not affordable for many average citizens. In America dentistry is an exuberant industry with expert, highly qualified dentists, but frightfully expensive. India offers the same quality of dental care dental treatments and you can receive services connected to dentistry like dental implants, tooth whitening procedures, therapeutic laser treatment and root canal treatment at a price that you can afford. The low cost is mainly because of the low labor cost in India. The staff and doctors who give patients quality treatment are at par with international standard of dentists. Dental Tourism India is a group of the dental centers offering quality treatments as it caters to many dental care dental solutions. So you can come to this center to have your tooth fixed and also make your holidays excellent at the same time. Every kind of modern dental treatment facility is available at Dental Tourism India for example cosmetic and restorative dentistry, crown and bridge for fixed replacement of broken and missing teeth, root canal treatment or dental implants. Dental surgical procedures are done by specialists like oral and facial surgeons. You can therefore take any treatment that you require from here and combine it with a memorable holiday of the sightseeing spots of India. Dental treatment in India is not expensive when you compare it with cost of treatments in western countries. Many people come every year from the USA and Europe for dental treatment to India and then visit tourist places after it. This is a new form of tourism which has developed in which the dental treatments are clubbed with tours, and several dental travel agencies provide specialized services in this regard. fraction of the cost in India. have their treatments done and then enjoy a free holiday and maybe even have funds left over. fact that dental treatment is so expensive in many countries. which means patients can enjoy their holiday to the full. Dentists can charge up to $400 for a Dental Filling in USA & Europe. It costs only $20 in India. in the world and are world class. dentists practice in the West. to India for the substantial reductions in cost. which is passed on as a cost saving to patients. cosmetic dentistry or restorative dentistry India can provide for your needs at vast cost savings.